I am one of those people who adores all things breakfast from beans on toast to a vegetarian full English or even a piece of cheese on toast every now and again, although I love all of those things having them over and over can be a bit boring. Today curtsy of the Co-op and their surprise package of goodies I am bringing your breakfast a make over with some ideas which will help spice up your breakfast and give you some new life when it comes to your traditional breakfast ideas. 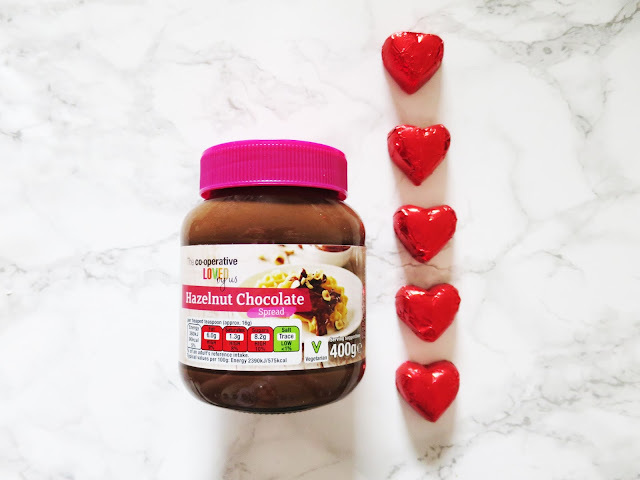 Have a bit of Europe with your breakfast, although croissants aren't the healthiest option in the world they are super filing and go with pretty much everything, from chocolate spread, to jam and even just a lashing of butter. 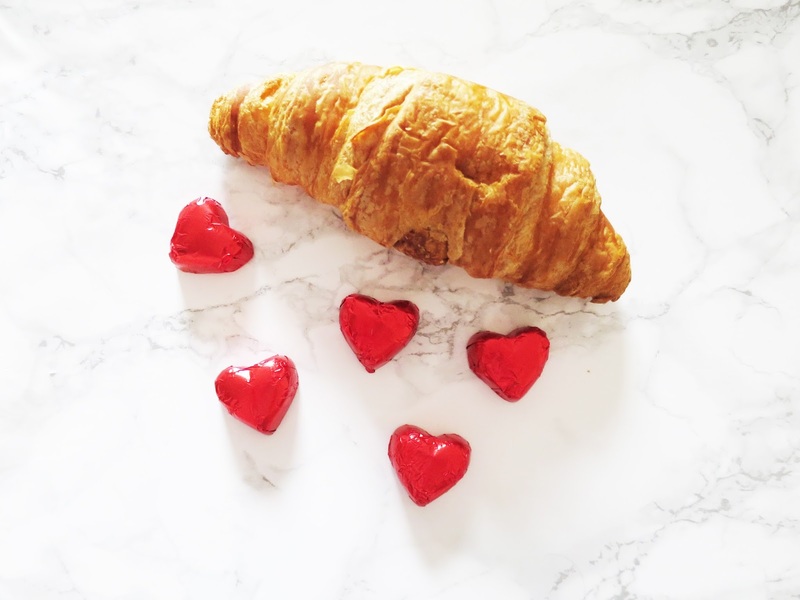 Have one or two to kick start your day with a glass of fruit juice and you're set for the day to mix it up a little use different things inside your croissant. If you are one of those people who get hungry quickly finish of your croissants with a piece of fruit or even a yoghurt of your choice. Everything is better if chocolate is involved, I love the idea of adding chocolate to your breakfast and the most simple way is through chocolate spread, you can add chocolate spread to almost anything, from Pancakes to Toast you can't go wrong with a good old pot of chocolate spread. With so many varieties of eggs to choose from it's no wonder most of us love our eggs with breakfast, from poached eggs to soft boiled and beyond. You can do so many amazing things with eggs, and there are so many different recipes out there for you to trial out and see what suits you. If you fancy finding any recipes check out the Co-op website or click this link. It's always at the start of the year when people decide to make changes to their lifestyle, whether that be to loose weight or just to live a healthier lifestyle from one time to another we have probably all tried something along those lines. It's now quickly approaching March, and I can't believe we are going to be into the third month of the year already. 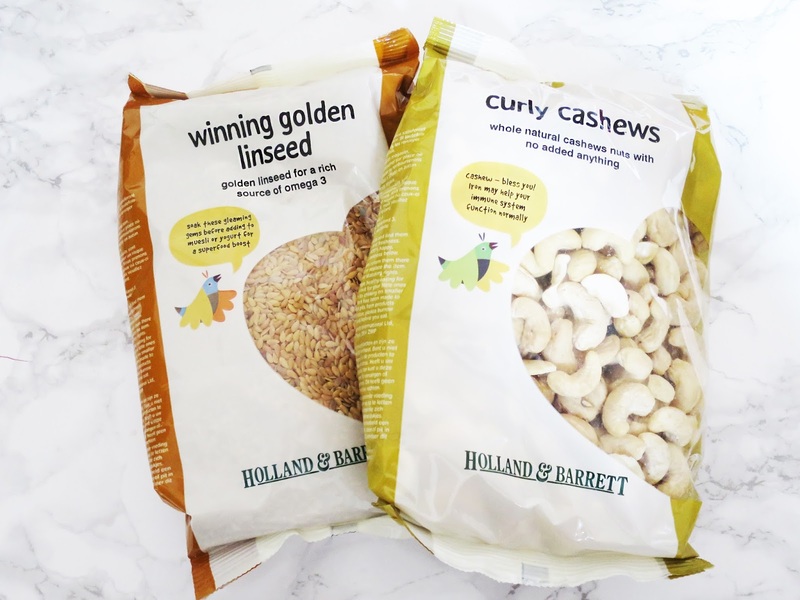 Recently the lovely people at Iprospect got in touch about a campaign they were running with a company you've probably all heard of Holland and Barrett. If you don't know who Holland and Barrett are, they are a company who specialise in vitamins, minerals and herbal supplements (in other words, all of the good stuff you need). The idea behind the campaign is to follow a meal plan which a nutritionist has written for a week and then to make long lasting changes to your diet to make you feel better on the inside and even work towards other goals like loosing weight. 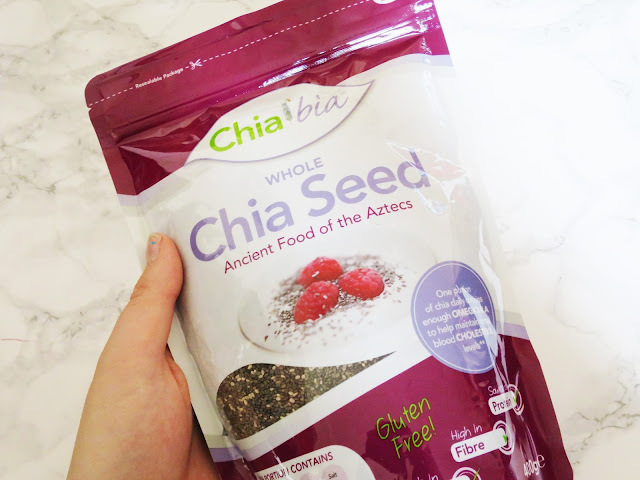 I was sent a huge variety of products including Chia Seeds, Nakd Bars, Manuka honey and plenty of other stuff. The first thing I had to do with the plan was change some of the meals so they fit my vegetarian lifestyle as the original was for meat eaters. 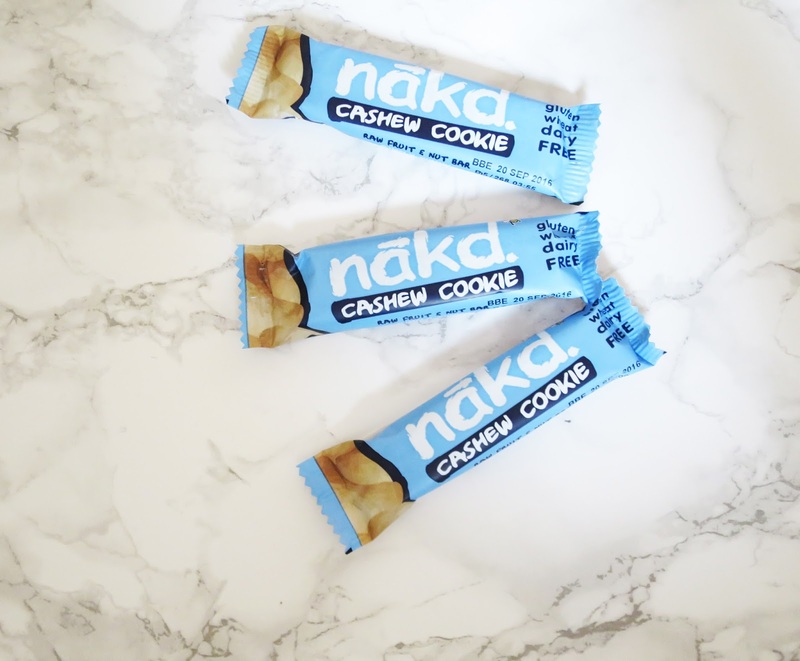 The plan provided so many different snack alternatives which were super healthy which I loved to try out as I am usually one of the people who ends up snacking on crisps and other unhealthy alternatives. I was over the moon to find out that one of my favourite meals was included in the plan, spaghetti bolognese and I even got to make double portions for the day after, win! The things I found hardest about the plan were the fact that it include a lot of dairy or dairy substitutes and I am not a huge fan of dairy/milk so I wouldn't include those into my daily life. But I found some new products which I can use in other things like Chia Seeds and Cacao Power and as well as some very tasty snacks. I found it fairly easy to stick to and I would take the outline of this plan and make it more me, but include lots more healthy products into everyday as I found it made a huge difference to my energy levels and the way I felt everyday. 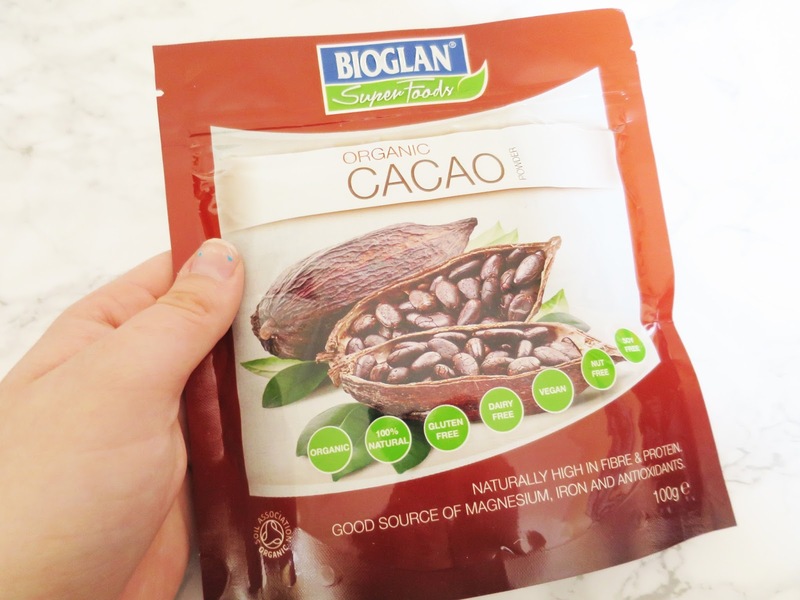 For future ideas I had the idea after looking through Pinterest is to get some cacao powder to make protein balls out of and these make amazing snacks before or after the gym as they're full of energy and taste pretty good too. I like idea of cooking with coconut oil instead of regular oil as it's a healthier alternative and also tastes yummier. For one of the meals included in the plan coconut oil was used and made the meal itself 100x more tasty which is what people who want to loose weight want as a lot of 'diet' food is seen to be boring and bland. I will definitely be including cashew nuts into my daily diet as they are fab for a snack and are hardly any calories. Finally I found some amazing on the go lunch plans on Nic's Nutrition site and if you fancy checking that out you can do here. 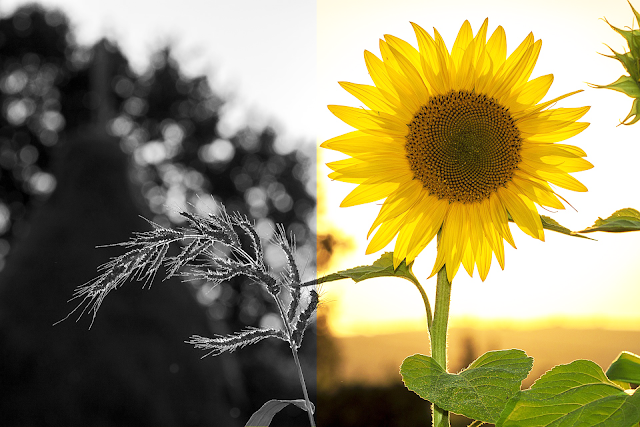 While taking part in this experiment I found myself lots of new healthy and fun ideas to include into everyday life, what do you want to make healthier in your life? If you've followed me on Twitter for a year or longer you'll know on the 27th of February 2015, I officially got my name changed to Olivia Jade from Jessica Leigh. Most people don't even know that Olivia wasn't my birth name and I like that, I enjoy people knowing me as the person I am rather than the person was, by this I just mean I got a fresh start with my new name. It's honestly the best feeling changing your name to something you like and what suits you, it's a powerful feeling and you feel like a whole new person. I have to admit as far as the legal side goes it's a bit of a pain to get all of your documents changed over but when it's done, it feels SO good. Although it took some getting used to for the people who didn't know me before, it's like my old name didn't exist anymore, when on occasion I get called Jess, I don't even respond anymore because to me, that isn't me. To anyone who is thinking about changing their name, it isn't as hard as you may think nor is it as expensive as you think. If you do your research well and make sure you use a legit site else your name may not be accepted by places such as banks and the government, my documents are all legit and always are accepted. The hardest thing is having to always have a deed poll around when you want to do something legal like set up a new bank or something similar. But I love it all the same and I couldn't image being half as happy as I am now that I've gone and done it, because it was something I always thought about I just never had the courage to do it. I am so happy I've got so many supportive people in my life who stuck by me when I went through the process and didn't get mad or upset by my choice as I know some people would of. I know one day I will have none of my birth name left, but I am okay with that. I am still the same person at heart, just a different name. If you didn't read my original post about changing my name you, feel free to do so by clicking this link. If you want any advice about changing your name with the process or what life is like after, I am very happy to help just drop me an email or a tweet and I'll be happy to help. I haven't met many people who don't LOVE cats! With their adorable little faces and the sweet things they do and also the fact they're always great for cuddles. I have had my cat smudge for a long time, possibly even 10 years now and I couldn't imagine life without her. The way she can make my day by strolling into a room, the way she has the sweetest broken meow and the fact that she was abused in her previous family makes me SO sad and has left our poor kitty with the smallest stump of a tail. 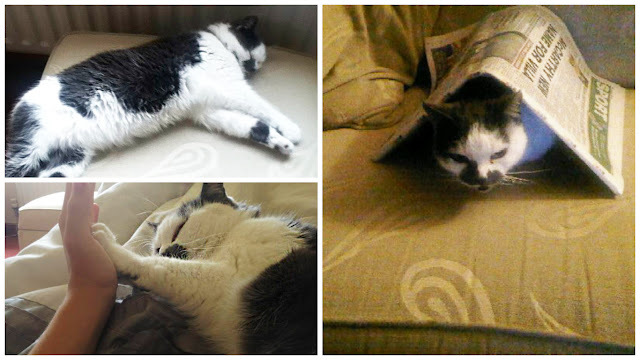 When we first got Smudge the first thing we did was get cat insurance for her as she was quite a jumpy little cat and we found her very quiet and she seemed to get ill a lot so we wanted to make sure she was covered for everything. Thankfully after she settled in she hasn't had to go to the vets much. 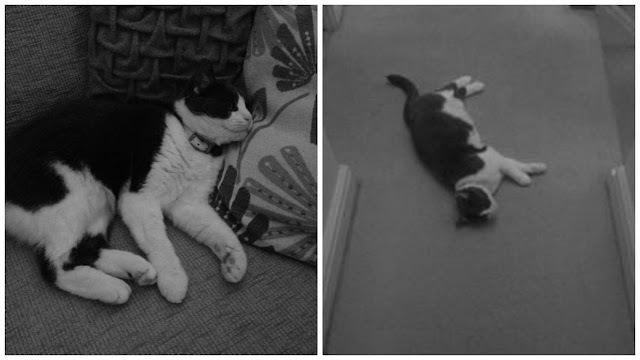 It's most recently in 2014 when we got our second cat Jessie, another adopted cat who was living with my mums friend but needed a bigger place to go. With Jessie she is the opposite to Smudge, she was lively and loud and does the funniest things and isn't scared of anything which I love about her. At first my cats didn't get on at all and it was a scary time as we didn't want to wake up and find either of them badly hurt or even worse, so we had to keep them separated for a while but eventually they got used to each other and even cuddle close which we are super lucky about as the chances are they may never have gotten along. I do feel that pets complete a family as they are always so loyal and keep me smiling. Although I don't live at home anymore, I still make regular visits to see my cats *coughs* .... my family too of course. I hope to one day when I have my own home have lots of cats running around as I love the idea of adopting animals and I wouldn't change them for anything. It's totally important to make sure that your pets are well looked after and kept happy and maintained well. Since I've moved out I've got a dwarf hamster but they are lot harder to look after than a cat although they require less attention they are a lot more difficult to let roam around!Especially mine as it likes to hide under the sofa (what a nightmare). I miss having my cats around everyday as they kept me smiling on bad days and are always great to hug! Hey all, I hope you're all feeling amazing today! So I thought I would bring you a bit of a different post and I hope you enjoy it, in 2016 I am all about saving money as this is my final few months of university and I have no idea where I'll be after uni so it's important I don't go completely broke. I love shopping there's no denying it, it's one of my favourite past times and gives me a lot of pleasure so that's why I thought I would show my favourite way to shop on a budget and that is through an amazing website called Ali Express which is basically a Chinese Ebay in English with some seriously good deals floating around. 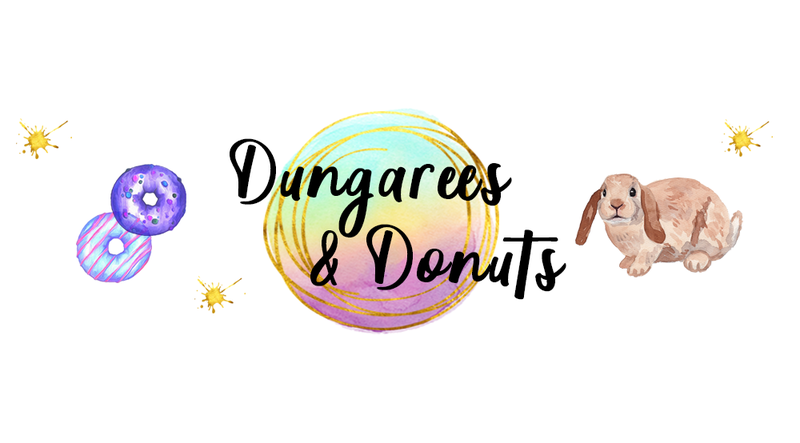 I was introduced to this site by the lovely Fii (who if you fancy checking out you can do here) and after looking into the site and doing some research myself I found some amazing things, even cheaper than Ebay including things like shoes, camera film and even some makeup items! Similar to Ebay you have to be wary of who you buy from, how long it will take to arrive, and what the item is actually like so for the first few purchases I would recommend just buying little things which you aren't in a hurry to receive as sadly items can take up to a month to arrive. My first purchase was a cute Baymax bag which I couldn't find but I thought I would show you some cute ones anyway. You can use the easy search filters at the top including price, where you want it to ship and even from along with things like free shipping and finding out the best results first. Once I found I could trust the website I started making more purchasing including random 3am ones which I am still receiving now! I found things on the website which I have paid a HUGE mark up on in other places which makes me super sad but I am happy I can now get even better deals. I think the best deal I have found upon Ali Express is 50 shots for my Instax 8 camera for £25.00 and it arrived in a matter of days, completely perfect when you can pay upwards of £20.00 for 20 shots which is a bit of a nightmare especially when you love taking pics and people get a hold of your camera and use them up. Finally I just thought I would show you a few cute pieces I've found whilst shopping around on the website in case you fancy getting your hands on any of them! Including cute stationary all under a pound with free shipping including stickers, pens and sticky notes, how cool! Would you shop on Ali Express? If you know me well, you'll know my favourite shop of all time is Paperchase, with all of the pretty notebooks, massive amount of coloured pens, even bigger amount of cards and lots of other cool stuff like rubbers, bags and now even a fitness range it's not wonder it's my favourite. If you are a stationery addict like me and you haven't heard of Paperchase you are seriously missing out! I have more notebooks than I can count on fingers and toes combined but I still have a serious thirst for even more! I recently did a haul for you lovelies and thought I'd show you what I got, in this post I am featuring some of their new and amazing fitness range which is no longer available to buy. As part of my haul I did get some Stationery goodness, which includes rubbers, a watermelon pen and also a recipe file. 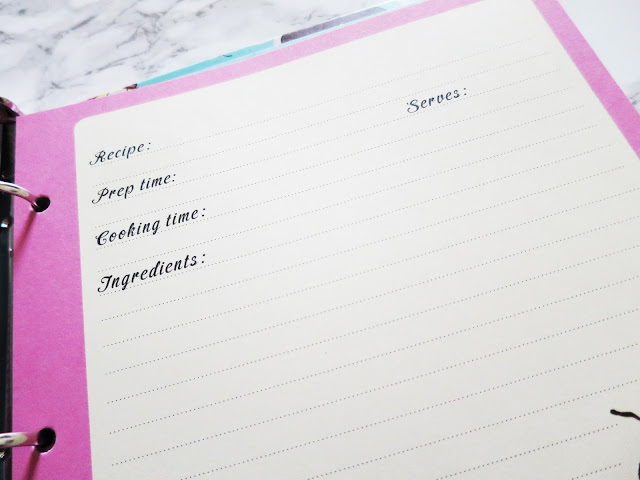 The recipe file is perfect for me at the moment as I am loosing weight and looking for new recipes all the time so it just seems perfect to store them inside and also develop your own recipes, I am forever printing out recipes then misplacing them which is annoying for when you want to make them again. 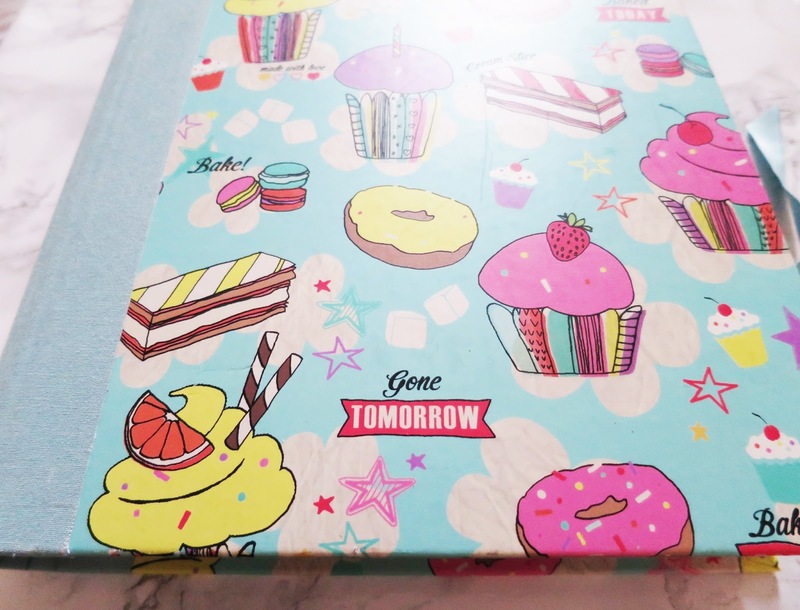 With pretty pink pages and inside and lots of folders to insert your own recipes or things which you've printed out, this is the perfect companion for any budding chef or just anyone who loves cooking and baking really. Next in my haul is the amazing fitness range which I mentioned earlier in this post, along with a gorgeous solar system thermal cup which is amazing for keeping my coffee warm on the go, but it's also so cute and would perfectly for decorative purposes. 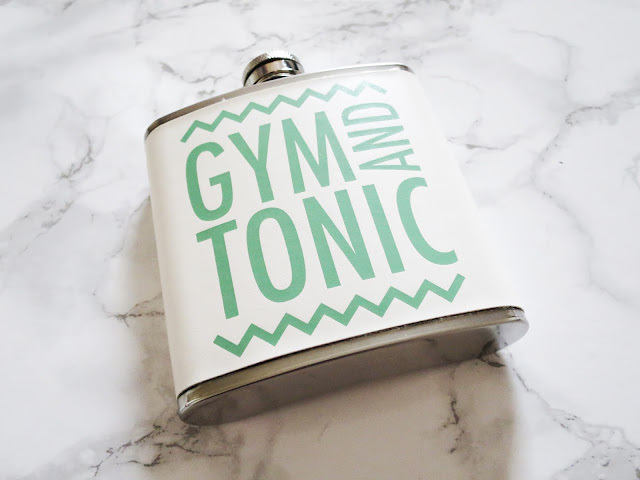 As part of their fitness range, I picked a water bottle, a makeup bag, a flask and a lunch box and although I probably won't use the flask very often it's so cute and I love the play on words which it includes. 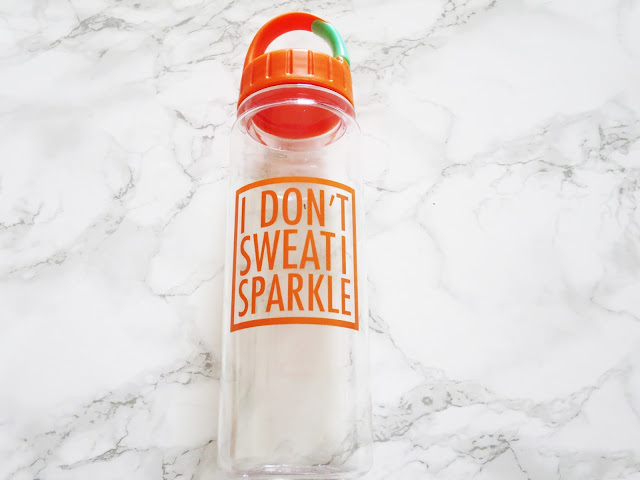 The water bottle is perfect to go to the gym with and it keeps me motivated throughout my workout whenever I am feeling like I am lacking that key motivation. 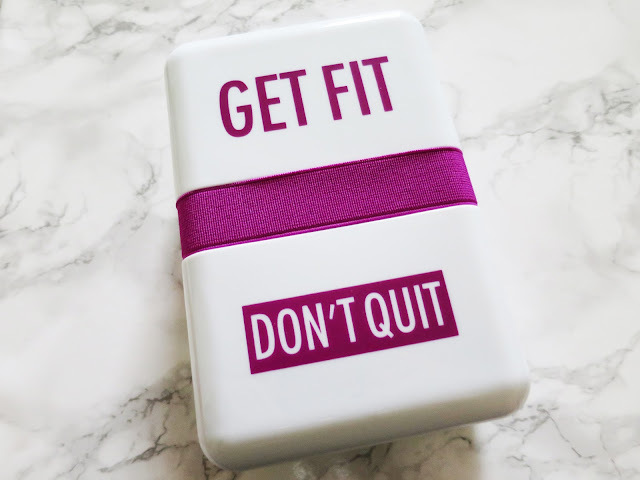 The lunch box is perfect for my packed lunch or when I am going out and about and I fancy some snacks, it's the best way to stay healthy when you're out in case of naugty snacking. The final part of my haul consists of a cute watermelon pen, which is perfect for keeping in my bag and it's chunky so won't get lost within the reems of other stuff in my bag *cough* receipts! 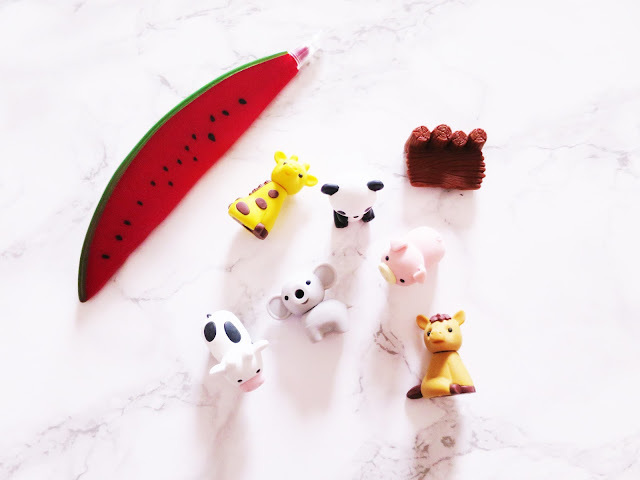 To top it all off I picked a cute pack of erasers of animals, I love these things and always buy them but never use them. But they make adorable decoration and I have to admit I've bought all of the donut ones I've ever seen as they are too cute to miss out on. I love the panda the most and he's got centre placement on my desk! 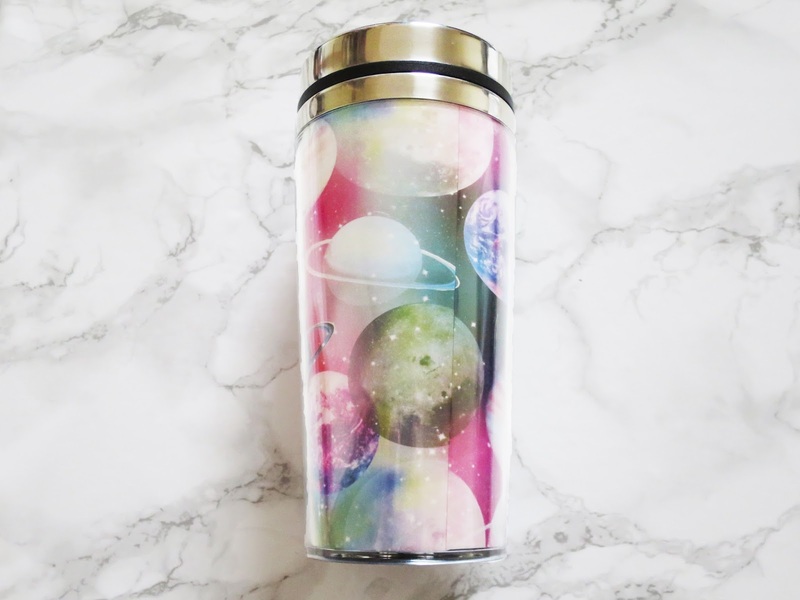 Do you love Paperchase as much as me? 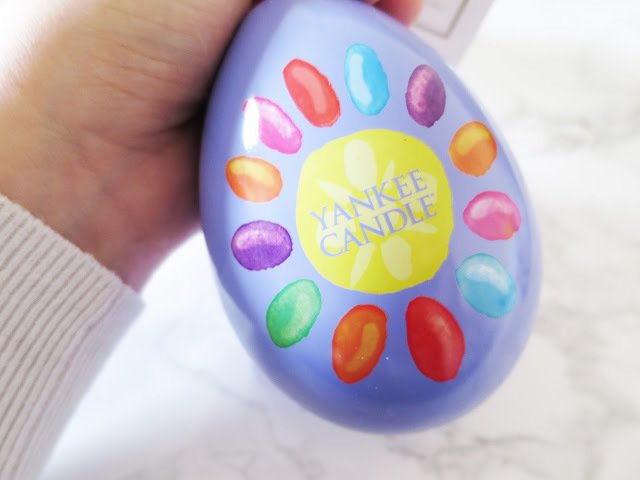 Pretty self explanatory scent, as it smells like a packet of jelly beans. 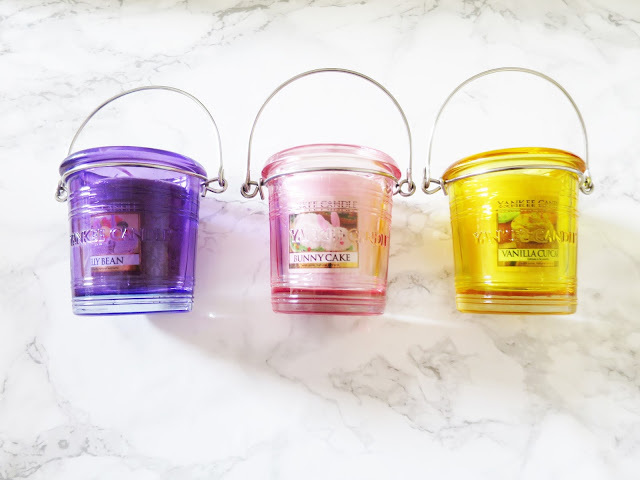 A mix of all things sweet and gives you that fun scent that you never quite grow out of and takes you back to those times of being in a sweet shop, the most strong smell in the candle I feel is strawberry which is such a pretty scent mixed with some other beautiful things. If you don't enjoy 'fun' scents it's possible this one isn't for you, but I love it. This is the perfect candle for anyone who loves the scent of Vanilla mixed with an extra scent of sugar, if you're not a fan of this avoid this candle for sure. I love this candle as it's a super sweet scent and I love everything vanilla from lattes to candles, it's the perfect scent. I've tried this candle in the large version and it's totally amazing and a perfect background scent as it's not too overpowering. 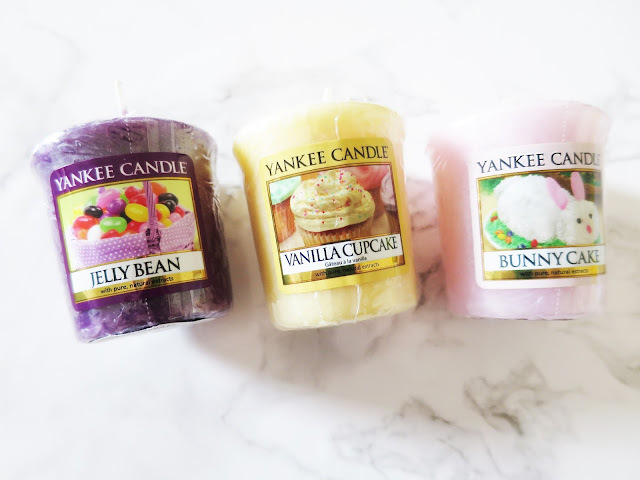 The bunny cake fragrance is made up of vanilla mixed with coconut and smells divine! If you are a fan of scents which are less 'overpowering' this is the perfect one for you. It's a pretty pale pink colour and I think the scent matches that. If someone made me cake that smelt like that I would be pretty impressed as it smells beyond lush! Got someone in your family who isn't a fan of chocolate? Give them this egg instead and I am sure they'll love it. A big purple egg filled with 3 wax melts from Yankee Candle. A perfect way to try out three scents before buying a bigger one or perfect for those who like to mix up their candles often *raises hand*. The three melts included are the Jelly Bean one which is mentioned above, cappuccino truffle which can I just say smells insanely beautiful and reminds me of the scent which I always smell when I go into a Yankee Candle shop *need to buy full sized version* and also summer scoop which again is so pretty and reminds me bubblegum ice cream which I could happily eat all day long (not the candle of course) the purple egg comes in at £7.95 which is amazing price for 3 wax melts and a cute egg! 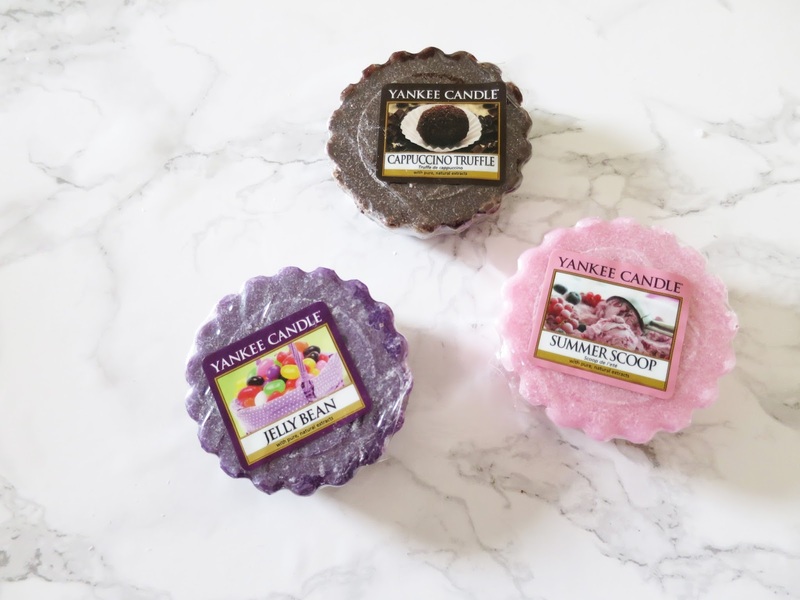 Now for your chance win some Yankee Candle goodies of your own, for this competition there will TWO winners each winning of one of the two prizes which are featured and that prize will be picked a at random for each winner, all you need to do to enter this competition is follow the Rafflecopter below and two winners will be chosen at random. UK only, sorry folks.